Contract furniture. A growing business for European companies. The attention paid to the Contract sector in the furniture industry is not just fashionable. According to CSIL, sales of contract furniture of European producers and contractors have seen a double-digit growth of over 15% between 2010 and 2015. This business has been constantly increasing in the last 5 years, at a yearly average rate of about 3%, and 2015 was among the best years (around 4%). During the economic crisis, the participation in projects in South East Asia, the Middle East and in other overseas markets was decisive in enabling the European industry to maintain a good average annual growth. European companies increasingly looked beyond their borders towards export markets. However, in 2014 and – to a greater extent – in 2015 the European market started to recover, and this rise was among those factors supporting the European industry. Over the last two years, a growth of sales was experienced in Retail, Hospitality and Office, the three main Contract segments covered by the 2016 edition of CSIL report: ‘The Contract Furniture and Furnishing market in Europe’. Together, these segments account for over 50% of aggregate contract sales of the European companies. A positive dynamics was also observed in most other segments, although with significant differences. 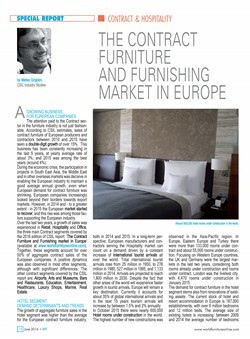 The growth of aggregate furniture sales in the Hotel segment was higher than the average for the European contract furniture industry, both in 2014 and 2015. In a long-term perspective, European manufacturers and contractors serving the Hospitality market can count on a demand driven by a constant increase of international tourist arrivals all over the world. Total international tourist arrivals rose from 25 million in 1950 to 278 million in 1980, 527 million in 1995, and 1,133 million in 2014. Arrivals are projected to reach 1,800 million in 2030. Despite the fact that other areas of the world will experience faster growth in tourist arrivals, Europe will remain a key destination. Currently, it accounts for about 35% of global international arrivals and, in the next 15 years, tourism arrivals will increase by between 1.5% and 2% annually. In October 2015 there were nearly 600,000 Hotel rooms under construction in the world. The highest number of new constructions was observed in the Asia-Pacific region. In Europe, Eastern-Europe and Turkey there were more than 133,000 rooms under contract and about 55,000 rooms under construction. Focusing on Western Europe countries, the UK and Germany were the largest markets in the last two years, considering both rooms already under construction and rooms under contract. London was the liveliest city, with 4,470 rooms under construction in January 2015. The demand for contract furniture in the hotel segment stems also from renovations of existing assets. The current stock of hotel and resort accommodation in Europe is 187,000 establishments, with over 6 million bedrooms and 12 million beds. The average size of existing hotels is increasing: between 2009 and 2014 the average number of bedrooms per establishment rose from 29 to 32. The average furniture and furnishing renovation rate for a hotel is estimated to be around 8 to 10 years, with partial renewal every 5 to 7 years and a complete refurbishment every 20 years. Prices for fitting hotels vary considerably. Furnishing a 3-star hotel room costs on average around Eur 5,000 – Eur 6,000 whereas it is more difficult to determine an average price for high-end hotels. The price structure of the different furnishing elements of guestrooms and communal parts can change according to the specific features of geographical markets. 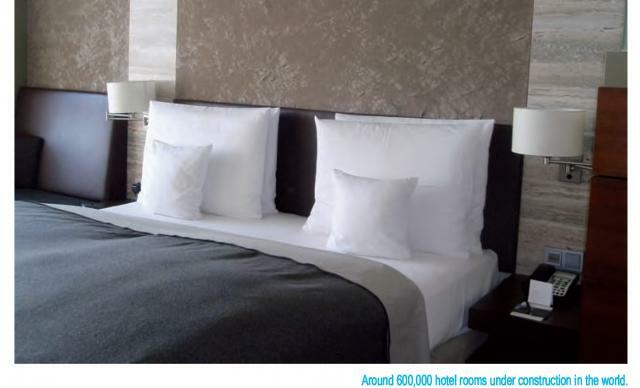 The channels through which contract furniture firms win commissions for projects in the hospitality market are various. However, some key aspects are common. One of them is the importance of nurturing relationships with architects who usually play a pivotal role, especially in major projects. Particularly for firms providing turnkey solutions for the establishment of new hotels, or within major renovations, a good reputation among architects is a valuable asset. Innovative hotel concepts are being developed to follow the changing demand of new potential customers. Hoteliers wishing to satisfy the “Millennials”, i.e. those born between the 1980s and the early 2000s, opt to provide limited services at lower prices, replacing large guestrooms with smaller ones and emphasizing the role of common areas, giving attention to eco-sustainability and high-tech issues. Within the frame of the European market recovery, the UK was among the best markets. Construction output increased considerably in 2014-2015. London has been an important market for projects in real estate, providing significant opportunities for furniture contractors. The high price of houses goes together with a relatively greater demand for high-end products in the real estate segments. Retail trade increased by 3% in 2014, and the shopfitting market grew by over 5%. London is a key target destination for luxury retail brands wanting to expand their store portfolios. London was also the liveliest city in Europe in terms of construction of new hotel rooms. The key importance of London lies also in the impressive density of major architectural and design companies headquartered or with offices in the city. Major studios based in this city choose (or at least play a fundamental role in helping the customers to choose) furniture and furnishing products for the interiors of projects all over the world. This also explains the high density of furniture and furnishing showrooms in the city. In fact, many furniture manufacturers in the upper range opened new showrooms recently.